First, the school nurse or pediatrician suggests your child have an eye exam. Next, you are left holding a little piece of paper indicating that your child's big beautiful eyes need some assistance; spectacles, eyewear, corrective lenses, GLASSES! Call it what you will, it can be pretty confusing and downright scary for a parent and child to enter the wonderland of vision correction. It needn't be. Several tips can make your trip a little easier. The most important aspect of a pair of glasses is how they fit. Children's glasses are not miniature versions of adult glasses. Grown-up noses and cheeks are proportioned differently than children's, and spectacle frames need to reflect this in order to fit properly. Experienced children's opticians keep these differences in mind when assisting you in choosing eyewear. Remember that your child is undergoing rapid growth and an improperly fit frame can cause alterations in developing bone, breathing problems and even create further damage in the vision problem the glasses are supposed to correct. As a child grows, the nose and cheeks change in shape and prominence, so don't expect a child to "grow into" a pair of glasses. Ordering glasses "a little bit too big" only causes discomfort, inadequate vision and the frames slide down the nose. By the time they "grow into" the frame, it will no longer fit due to changes in facial features. Because they are more active,children are going to be tougher on their glasses, so look for good quality metal or plastic frames with flexible spring hinges – and a good warranty! Lenses made of polycarbonate, a very strong plastic are a must. Regular plastic and glass lenses can shatter into shards that can lacerate delicate eye tissue. Polycarbonate lenses are more shatter resistant and therefore much safer glasses. Of course, any lens can scratch if not cared for properly, so here again it's a good idea to compare warranties on lenses. Spectacle lenses can be replaced; children's eyes can't. Many times the biggest initial concern of a parent is whether their child will wear the glasses once they've received them. If a child sees better out of the glasses, at least up to the age of ten, there probably won't be any problem, even with toddlers. If you are having trouble getting your child to keep their glasses on, first check to see if the glasses fit properly. Children tend not to complain about sore ears and noses as an adult might, so check for redness behind the ears or on the sides of the nose to be sure the frames aren't rubbing uncomfortably or sliding around. Make sure the glasses aren't falling down on the nose, which can cause distorted and decreased vision. Often it only takes a simple adjustment of the nosepads or temple pieces to make things comfortable again. If you are still meeting with resistance and the glasses are fitting well, a recheck visit with the prescribing doctor may be necessary to be sure the child is seeing well through the lens power that was prescribed. Glasses for children are often like "medicine," and sometimes the strength of the "medicine," or lenses, needs to be adjusted to get the desired results. If the frame fit and visual acuity are not the problem, your child may be unhappy with the appearance of the glasses. This can be avoided with some tricks in the initial stages of frame selection. First, let your child have some input in deciding on the glasses. Frames they help to select are more apt to be worn than those selected without their input. There are more important things in your child's life to argue about than frame color. Second, if your child has a strong prescription,the glasses can look thick and uncomfortably heavy. Talk to your optician about special polycarbonate lenses in an aspheric design which cut down on thickness, weight and distortion. 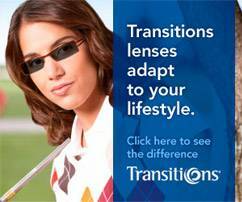 In stronger prescriptions, these lenses are more cosmetically pleasing. Anti-reflective coatings on the lenses not only cut down on discomforting glare but also remove reflections from the front of the lenses, again making the glasses more cosmetically acceptable. All these options add to the price of the glasses, but paying a little more for eyewear that will be worn is a better investment than getting a pair of glasses that end up shoved in the back of a drawer. If, after all this, you are still having standoffs with your child about wearing glasses, there are a few persuaders left. Try to find some pictures of bespectacled sports figures or film stars that your child admires to serve as role models. Make sure you wear your glasses if you need them – even go so far as putting your contact lenses away for a couple of weeks in order to set an example for your child to follow. Find old pictures of yourself, friends or relatives when they were kids with their first pair of glasses. This can be a lot of fun for everyone and can make your child realize just what great looking glasses they have! You can even throw an eyeglass party and invite all your child's friends to "celebrate" the new glasses. Remember, your child's visual development affects growth and development in many other areas. You are looking for more than just a pretty frame for your cute little picture!